One of the things I've loved about working on Shoes of Prey is that I can work from anywhere. 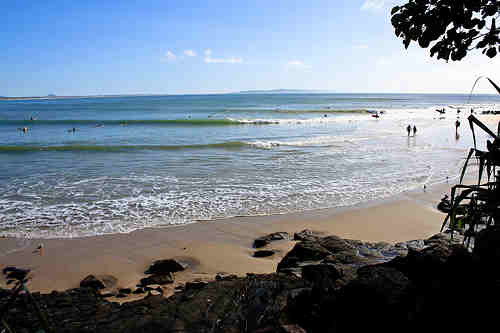 Our office, the couch, the bus, China, or where Jodie and I are now - Noosa. We're up in Noosa for a friend's wedding so we came up to Brisbane a week earlier to catch up with friends and family and we were still able to work each day while staying at my mum's place. That wasn't really possible in my previous jobs. The flip side of this is that it's hard and sometimes impossible to switch off. It's Saturday morning, we're in Noosa and Jodie and I are both sitting on our bed with our laptops, working. Beautiful beach, looks like the one I got married on. Hope your friends wedding is fantastic! Thanks Patty, the wedding was fantastic!